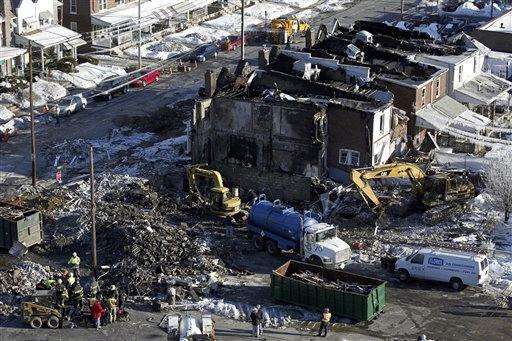 ALLENTOWN, Pa. (AP) - The bodies of four victims of an explosion and natural gas fire that engulfed a row of homes have been identified, but authorities said Friday that the final victim will have to be positively identified through DNA testing. The final body was discovered late Thursday, nearly 24 hours after hundreds of residents fled the massive fire in an area where the underground gas main lacked shut-off valves. Lehigh County Coroner Scott Grim identified four victims as 79-year-old William Hall, 69-year-old Ofelia Ben, 16-year-old Katherine Cruz and 4-month-old Matthew Vega, and said the final victim was female. The Morning Call newspaper identified her as William Hall's wife, Beatrice, citing the couple's daughter-in-law. Residents reported hearing a massive explosion shortly before 11 p.m. Wednesday. Neighbors said the blast knocked shelves off of walls, brought down ceilings and, in one case, ripped the front door off its hinges. It took utility workers five hours of toil in the freezing cold to punch through ice, asphalt and concrete and seal the 12-inch gas main with foam, finally cutting off the flow of gas that fed the raging flames. About 24 hours after the Pennsylvania explosion, a gas pipeline blast shook residents in the eastern Ohio town of Hanoverton, damaging a house but causing no injuries. Robert Newberry, a spokesman for El Paso Corp., which operates the pipeline, said the Ohio explosion involved an underground, 36-inch gas line. Mechanisms automatically shut off the segment where the accident occurred, and the residual gas burned off, he said. In September, a 44-year-old gas transmission line ruptured in San Bruno, Calif., killing eight people, injuring dozens and leaving 55 homes uninhabitable. Investigators said the pipe had numerous flawed welds. And in Philadelphia last month, a gas main explosion sent a 50-foot fireball into the sky, killing a utility worker, injuring six people and forcing dozens from their homes. Fire officials are investigating.